Lynn Weinig focuses her practice on Real Estate and Corporate related matters. She advises clients on a broad spectrum of areas, including general and commercial matters, public sector and real estate. Ms. Weinig provides counsel to a diverse clientele of individuals and public and private sector entities. 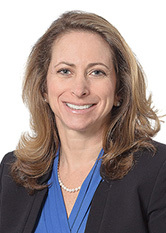 She has practiced extensively in the field of real estate law in both commercial and residential real estate transactions, including representation of real estate associations (including not-for-profit, condominiums and cooperatives). Ms. Weinig also practices public sector law where she has been involved in legal management of complex public sector projects involving infrastructure, regulatory compliance, land use, environmental issues, construction, contracting, and risk management. She has been involved in legislative matters, board representation, policy development, program planning and implementation, transactions, real property management and disposition, bidding and procurement procedures, as well as general litigation. Ms. Weinig has been involved in contracting, permitting and agency proceedings with Federal, State and County regulatory agencies, including the Department of Environmental Conservation, Department of Health (State and County), Public Service Commission, New York State Environmental Facilities Corporation, United States Environmental Protection Agency, and New York City Department of Environmental Protection.